Through most of the 1990s energy supplies were plentiful and prices were low. The Economist speculated about the political consequences of a world in which oil declined to $5 per barrel. U.S. foreign policy generally accorded little attention to energy, except in special circumstances such as the location of strategic pipelines in Central Asia. In recent years, energy prices have surged. President George W. Bush, in this year's State of the Union address, warned of an addiction to imported oil and its perils. Yet there is no consensus on what should be done to shake the addiction. Virtually everything concerning energy has changed—except U.S. policy. The Council on Foreign Relations established an Independent Task Force to examine the consequences of dependence on imported energy for U.S. foreign policy. Since the United States both consumes and imports more oil than any other country, the Task Force has concentrated its deliberations on matters of petroleum. 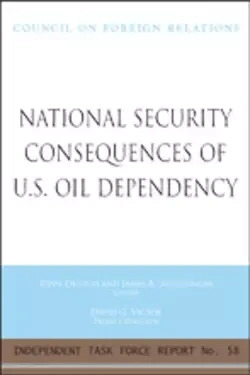 In so doing, it reaches a sobering but inescapable judgment: The lack of sustained attention to energy issues is undercutting U.S. foreign policy and national security. The Task Force goes on to argue that U.S. energy policy has been plagued by myths, such as the feasibility of achieving "energy independence" through increased drilling or anything else. For the next few decades, the challenge facing the United States is to become better equipped to manage its dependencies rather than pursue the chimera of independence. The issues at stake intimately affect U.S. foreign policy, as well as the strength of the American economy and the state of the global environment. But most of the leverage potentially available to the United States is through domestic policy. Thus the Independent Task Force devotes considerable attention to how oil consumption (or at least the growth in consumption) can be reduced, and why and how energy issues must become better integrated with other aspects of U.S. foreign policy. To learn more about Independent Task Forces at the Council on Foreign Relations, click here. Graham T. Allison is Douglas Dillon Professor of Government and Director of the Belfer Center for Science and International Affairs. From 1977 to 1989, Dr. Allison served as Dean of the John F. Kennedy School of Government. Dr. Allison has also served as Special Adviser to the Secretary of Defense under President Ronald Reagan and as Assistant Secretary of Defense for Policy and Plans under President Bill Clinton. Norman R. Augustine retired in 1997 as Chairman and CEO of Lockheed Martin Corporation. Prior to the formation of Lockheed Martin, he had served as Chairman and CEO of the Martin Marietta Corporation since 1987. Formerly, Mr. Augustine served in various posts at the Pentagon, including Undersecretary of the Army. Robert Belfer is the CEO of Belfer Management LLC, a private investment firm. Mr. Belfer has enjoyed a long career with Belco Petroleum Corporation, where he was named Chairman in 1985. In 1992, Mr. Belfer founded Belco Oil & Gas Corporation, an independent petroleum producer. Stephen W. Bosworth is the Dean of the Fletcher School of Law and Diplomacy at Tufts University. Dean Bosworth has had an extensive career in the U.S. Foreign Service, including service as Ambassadors to the Republic of Korea, Tunisia, and the Philippines. He also served in a number of senior positions in the Department of State, including Director of Policy Planning. Task Force members Robert A. Belfer and Philip R. Sharp (foreground), and Bennett Johnston and Ernest J. Moniz at a Task Force session. Helima L. Croft is a Senior Strategist with the Business Intelligence Group at Lehman Brothers. Formerly, she was an Intelligence Fellow at the Council on Foreign Relations. Dr. Croft spent four years at the Central Intelligence Agency, where she was a Senior Economic Analyst in the office of Asian Pacific, Latin American, and African Analysis. John Deutch, cochair of the Task Force, is an Institute Professor at the Massachusetts Institute of Technology. Mr. Deutch has been a member of the MIT faculty since 1970, and has served as Chairman of the Department of Chemistry, Dean of Science, and Provost. Mr. Deutch has also served in many senior government posts, including Undersecretary of Energy, Deputy Secretary of Defense, and Director of Central Intelligence. Charles DiBona is the current Chairman of the Sentient Council and retired Chairman of the Board of Logistics Management Institute. Mr. DiBona served nineteen years as President and four years as Executive Vice President with the American Petroleum Institute. Mr. DiBona has also served as a Special Consultant to the President of the United States under Richard Nixon. Jessica P. Einhorn is Dean of the Paul H. Nitze School of Advanced International Studies (SAIS) at Johns Hopkins University. Dr. Einhorn served a twenty-year career in various positions at the World Bank, including as Managing Director from 1996 to 1998 and as Visiting Fellow at the IMF in the wake of the Asian financial crisis. Martin Feldstein is the George F. Baker Professor of Economics at Harvard University and President and CEO of the National Bureau of Economic Research. From 1982 through 1984, Mr. Feldstein was Chairman of the Council of Economic Advisers and Ronald Reagan's Chief Economic Adviser. He served as President of the American Economic Association in 2004. David L. Goldwyn is President of Goldwyn International Strategies. He served as U.S. Assistant Secretary of Energy for International Affairs from 2000 to 2001, and as National Security Deputy to former U.S. Ambassador to the UN Bill Richardson. Michael D. Granoff is President and Chief Executive Officer of Pomona Capital, an international private equity investment company. Prior to his business career, Mr. Granoff previously served on the staff of the U.S. House of Representatives Appropriations Subcommittee on Foreign Operations and on the 1992 Presidential Transition Team at the Department of the Treasury. David G. Victor, John Deutch, and James R. Schlesinger discuss the Task Force report with Council members and media at a press conference in Washington, DC. J. Bennett Johnston is Chief Executive Officer of Johnston and Associates. Senator Johnston has had a long career in public service, including eight years in the Louisiana legislature and twenty-four years in the U.S. Senate. During his time in the Senate, he served as Chairman of the Senate Committee on Energy and Natural Resources. Arnold Kanter is a Principal and Founding Member of the Scowcroft Group. Dr. Kanter has served as Undersecretary of State from 1991 to 1993 and as Special Assistant to the President from 1989 to 1991, in addition to holding a variety of positions in the State Department. Karin M. Lissakers is Director of the Revenue Watch Institute and serves as Chief Adviser to George Soros on globalization issues at the Soros Fund Management. Previously, Ms. Lissakers held the post of U.S. Executive Director on the Executive Board of the International Monetary Fund from 1993 to 2001. Walter E. Massey is President of Morehouse College. Dr. Massey has served as Provost and Senior Vice President for Academic Affairs at the University of California, Vice President for Research at the University of Chicago, Director of the Argonne National Laboratory, and Director of the National Science Foundation. Ernest J. Moniz is the Cecil and Ida Green Professor of Physics and Engineering Systems and Codirector of the Laboratory for Energy and the Environment at the Massachusetts Institute of Technology, where he has served on the faculty since 1973. Dr. Moniz served as Undersecretary of the Department of Energy from October 1997 to January 2001. William K. Reilly is Founding Partner of Aqua International Partners. Mr. Reilly is also cochairman of the National Commission on Energy Policy. He has previously served as the first Payne Visiting Professor at Stanford University, Administrator of the U.S. Environmental Protection Agency, President of the World Wildlife Fund, and President of the Conservation Foundation. James R. Schlesinger, cochair of the Task Force, is Chairman of the MITRE Corporation and a Senior Adviser at Lehman Brothers. He is also a consultant to the U.S. Department of Defense (DOD), a member of the Defense Policy Board, member of the Arms Control Nonproliferation Advisory Board of the Department of State, and a member of the Homeland Security Advisory Council. Dr. Schlesinger formerly served as Secretary of Defense and was the nation's first Secretary of Energy. Peter Schwartz is Cofounder and Chairman of Global Business Network and a Partner of the Monitor Group. His current research and scenario work encompasses energy resources and the environment, technology, telecommunications, media and entertainment, aerospace, and national security. From 1982 to 1986, Mr. Schwartz headed scenario planning for the Royal Dutch/Shell Group of Companies. Philip R. Sharp is President of Resources for the Future. His career in public service over the last thirty-five years includes ten terms as a member of the U.S. House of Representatives from Indiana and a lengthy tenure on the faculty of the John F. Kennedy School of Government and the Institute of Politics at Harvard University, where he served as Director. James B. Steinberg is Dean of the Lyndon B. Johnson School of Public Affairs. Previously, he was Vice President and Director of Foreign Policy Studies at the Brookings Institution. Mr. Steinberg also served as Deputy National Security Adviser to President Bill Clinton, as well as Chief of Staff of the U.S. State Department and Director of the State Department's Policy Planning Staff. James R. Schlesinger with Task Force member Frank Verrastro at a Task Force meeting. Linda Stuntz is a Founding Partner of the law firm of Stuntz, Davis & Staffier, P.C. Her law practice includes energy and environmental regulation, as well as matters relating to government support of technology development and transfer. Previously, Ms. Stuntz served as Deputy Secretary of the United States Department of Energy under President George H.W. Bush, and played a principal role in the development and enactment of the Energy Policy Act of 1992. James L. Sweeney is Director of the Precourt Institute for Energy Efficiency, Professor of Management Science and Engineering at Stanford University, Senior Fellow of the Stanford Institute for Economic Policy Research, and Senior Fellow of the Hoover Institution on War, Revolution, and Peace. He is a Senior Fellow of the U.S. Association for Energy Economics, a Fellow of the California Council on Science and Technology, and a member of Governor Arnold Schwarzenegger's Council of Economic Advisers. Frank Verrastro is a Senior Fellow and Director of the Energy Program at the Center for Strategic and International Studies (CSIS). He has also served government staff positions in the White House (Energy Policy and Planning Staff) and the Departments of Interior (Oil and Gas Office) and Energy (Domestic Policy and International Affairs Office), including as Director of the Office of Producing Nations and Deputy Assistant Secretary for International Energy Resources. David Victor, Project Director of the Task Force, is Director of the Program on Energy and Sustainable Development at Stanford University and Adjunct Senior Fellow for Science and Technology at the Council on Foreign Relations. His research focuses on the political economy of energy markets, especially markets for oil, gas, and electricity in developing countries. J. Robinson West is the Chairman of the Board and Founder of PFC Energy. Previously, Mr. West served in the Reagan administration as Assistant Secretary of the Interior for Policy, Budget, and Administration. He also served in the Ford administration as the Deputy Assistant Secretary of Defense for International Economic Affairs and on the White House Staff.